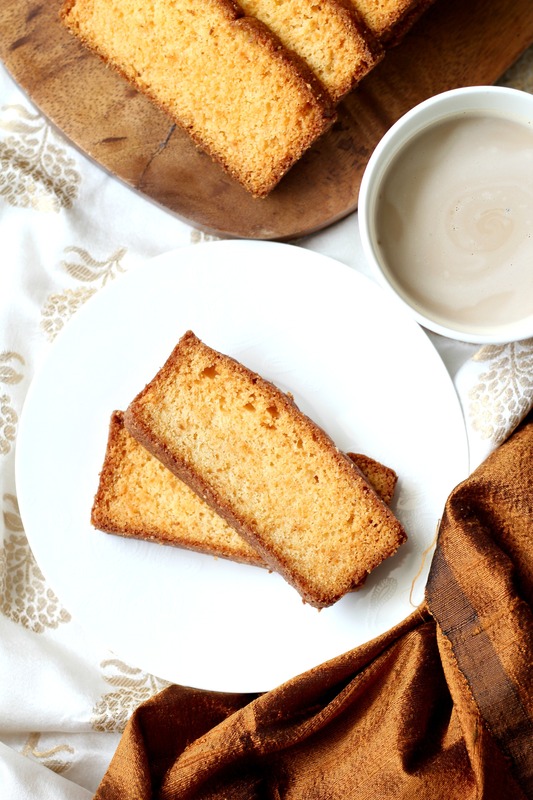 I was first introduced to the cake rusk by my husband when we lived in Mumbai. There used to be a nice bakery in Lokhandwala, the upscale shopping street dotted with shops of all kinds – bakeries, dairy & sweet shops, electronic & clothing stores and what have you. Being a huge fan of the cake rusk himself he occasionally brought home some that came neatly layered in a small disposable plastic box with a transparent lid. He would then enjoy a few with his evening coffee – a practice that is prevalent even now except that the store bought rusk has been replaced by wife-made ones. You see the man has a knack of arm twisting me into learning to cook/bake stuff that he thoroughly enjoys 😀 I use the word ‘arm twist’ as a figure of speech here (let me assure you that there is no violence involved) but he ensures that he chews my brains enough for me to want to get the monkey off my back once & for all. However, once done I don’t complain because, to be honest I would have never even been interested in cooking had it not been for his push & constant encouragement. Also I have learnt that I enjoy the journey of looking for recipes and making stuff myself and of course sharing it with you after perfecting the recipe. 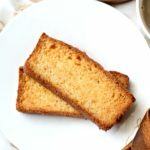 For my readers who are unfamiliar with the ‘rusk’, well it is a common sight in Indian bakeries and most homes that have a tea time ritual of dipping a rectangular piece of rusk into their hot cuppa. Rusk is simply dehydrated or re-baked pieces of bread. Some baker in the past definitely had a good idea of repurposing leftover bread. Cake rusk is taking the same idea forward and re purposing leftover sponge cake to make it a slightly-sweeter-than-rusk and more calorie dense treat than the humble rusk. You could call it the Indian take on the Italian biscotti! Same concept, different technique, simpler taste. The biscotti however has a slightly different shape owing to how the dough is rolled and cut before being double baked. The cake rusk is made using regular cake batter that is poured into a tin, baked into a cake and then re baked. Simple difference. So much fun! Over the past couple of years I must have attempted to make cake rusk using a zillion different recipes. Some of them turned out too sweet and some not crisp enough. Some had too much butter and hence crumbly and didn’t pass the dip test. Rusk is meant to accompany your hot cuppa, bite after bite after bite till you are left with a few crumbs on your finger tips and a pleasant feeling in your belly and not collapse into and settle at the bottom of your mug. A couple of months ago I came across a recipe in a picture of a cookbook that I had taken and found the recipe for a simple tutti frutti cake. 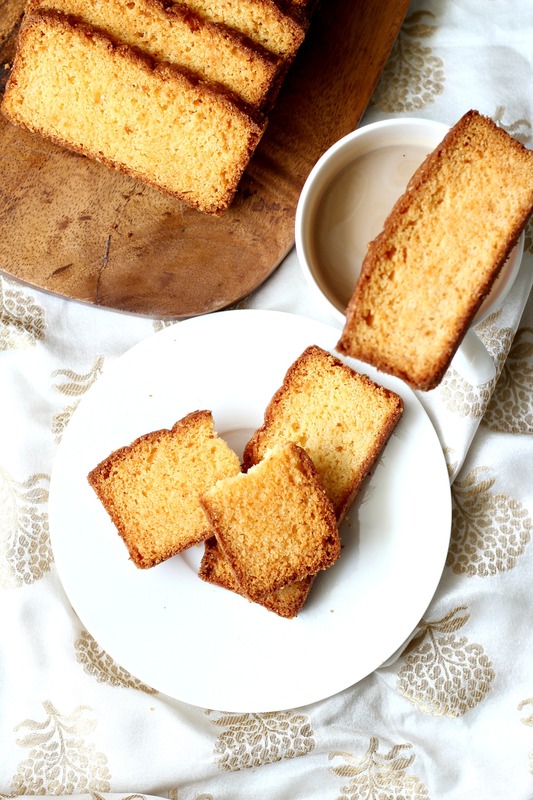 I decided to adapt the same recipe and bake the cake rusk and they turned out just perfect. The husband was elated. 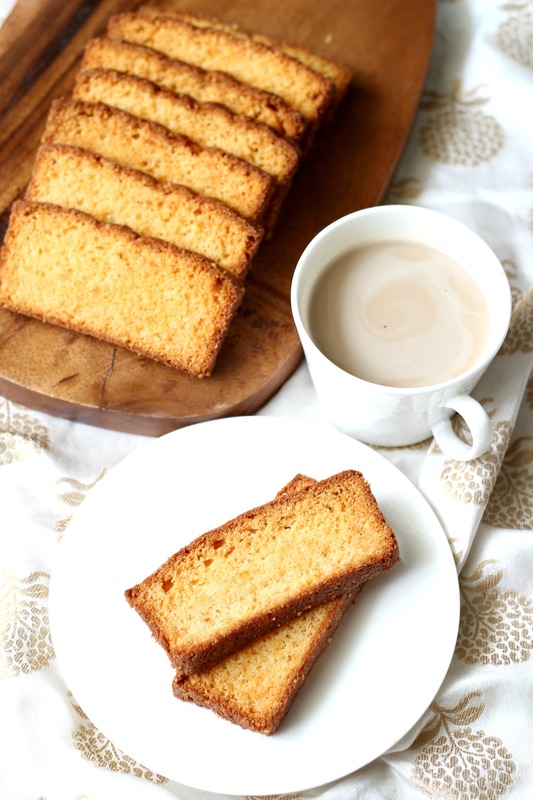 He finally had his favourite homemade cake rusk that he could enjoy anytime with his coffee. I don’t make it often though but just as an occasional treat. Click the image below to save this recipe on Pinterest! 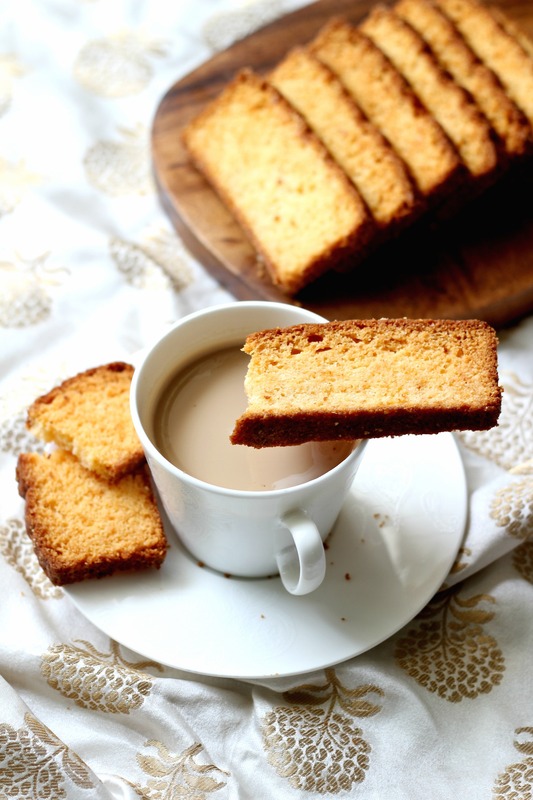 These crisp & delicious cake rusks are an Indian take on the biscotti! Served with a hot cup of tea or coffee, they make for a great tea time accompaniment! Preheat oven to 175 degrees C. Sift the flour, baking powder and pinch of salt together. Keep aside. In a large bowl, beat the butter and sugar till pale. Then add one egg at a time beating well after each addition. Add the vanilla extract and beat. Add the flour and yogurt alternatively. The dough will be slightly stiff but that is okay. Pour the batter into the prepared tin and bake for 40-45 minutes or till the skewer inserted comes out clean. Remove and let it cool on a wire rack. After 15 minutes, transfer the cake on the rack. Let it cool completely before cutting evenly into thin slices of approximately 1cm each. If you slice the cake before it has cooled, there are high chances of it crumbling, so be cautious. If you have used a 7"x7" square pan you can divide the cake into half and then make thin slices of each half. If a loaf pan is used you can simply make slices. Place the slices on a large baking sheet. Preheat oven to 150 degrees C and bake again for about 10 minutes, then flip the slices so that they bake on the other side for another 9-10 minutes. Remove the baking sheet and leave the slices to cool for about 10-15 minutes. You can gently transfer them to a wire rack to allow them to cool faster. When the rusks have cooled completely, transfer them into an airtight container. Enjoy some cake with a nice cup of tea! You can use virgin or pomace olive oil. However, it is better to use regular vegetable oil such as corn oil or sunflower oil or anything that doesn’t have a strong taste and aroma. Can you please the ingredients in terms of cup instead of grams?